I've already shown my master bath, my living room, and my master bedroom, and with most of those rooms it was pretty easy to make them look practically finished (which they are), but now we're going to start to get into rooms that are going to look more progress-y. Anyway, here are the before pictures. 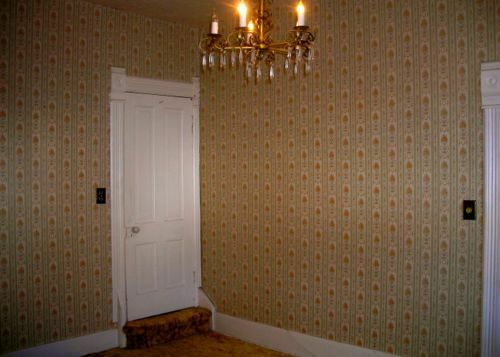 Yes, that's shag carpet in the dining room. 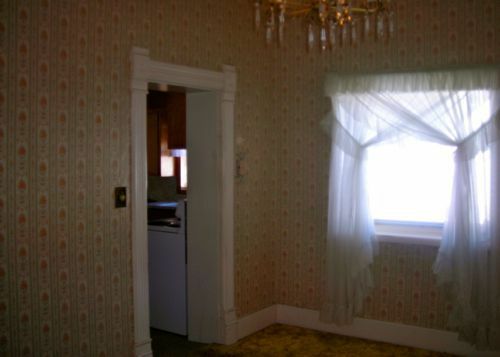 You'll notice that I kept the chandelier, and that the doors have fun old molding, but the window does not (that is, if you can see the window under the frilly curtains). 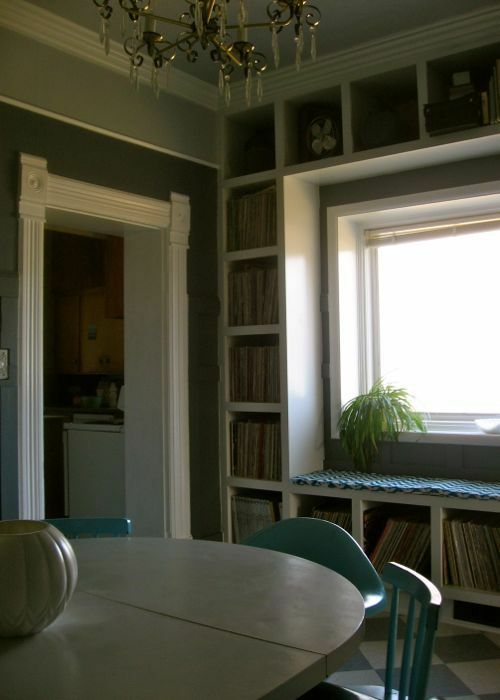 The first thing we did was fulfill a dream of mine to have built-in bookshelves and a window seat. Those built-ins are 73% full of Woo's record collection. This record collection and where it should live have been a source of marital discord for years. But now? No more. 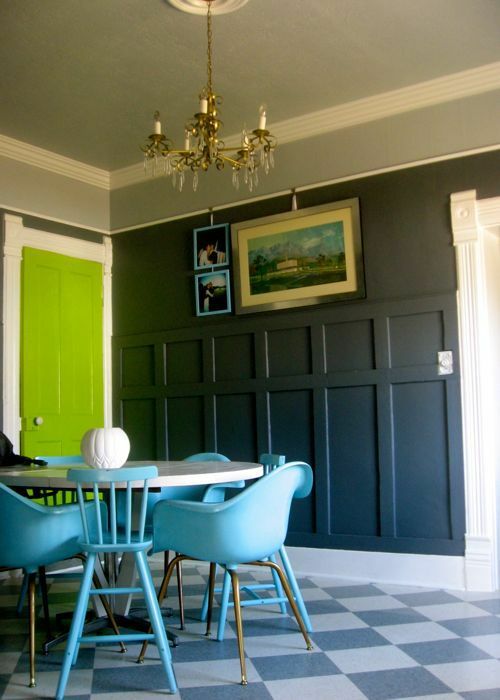 Yes, I did paint the doors in this room a bright, chartreuse green. And yes, I kind of like them. So sue me. 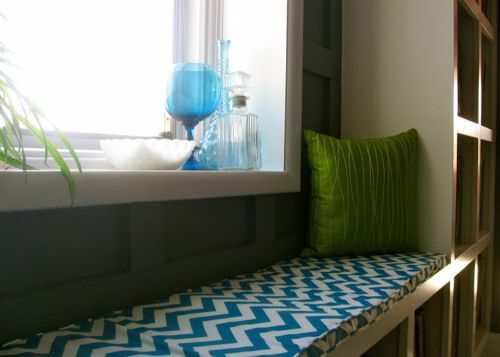 I made a pad for my window seat, but it really needs a couple more throw pillows to look good. You may be asking yourself why I didn't just run out and buy a couple of pillows before taking pictures. The answer is: I tried, but no one was carrying brightly colored pillows. I wonder why? It's almost as if neutrals and muted colors sell. This room is so close, I can almost taste it. The faux wainscoting needs a little work, we're in desperate need of a bigger (and nicer) table, some more pillows, some more art, and we're done! 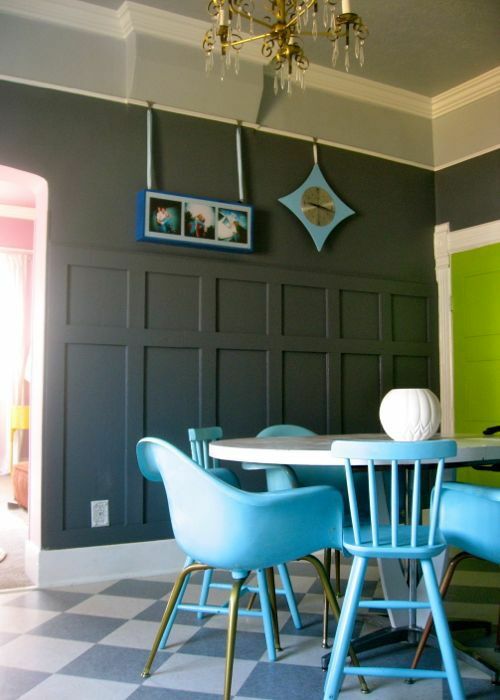 Pssst -- checkout the dining room now, and don't forget to sneak a peak at the other rooms in The Pad!